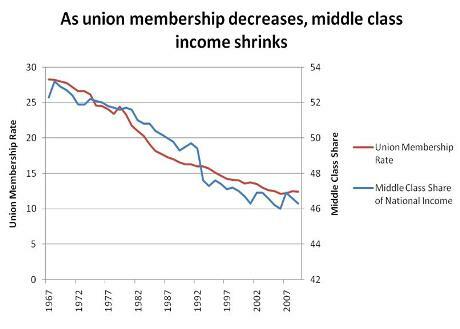 Looking at the chart I provided, it is easy to see the link between unionization and the prosperity of the middle class. However, contemporary society finds it in vogue to blame unions and to try and dismantle them. The destruction of unions results in the lowering of hourly and salaried incomes, the reduction in employee rights and benefits, and the increase in the number of years needed to retire. I freely admit that some unions are better than others, and I do not agree 100% with my own association; however, what organization acts in accordance with 100% of anyone’s views? Ultimately, unions are a net gain for workers. Protect your fellow worker and you protect yourself. This entry was posted in Union on August 10, 2011 by drpezz. True, however, the political and economic changes inherent in one of the two major parties included attacks on unions in order to lessen their strength and their ability to maintain a robust amount of national wealth in the middle class. The shrinking of unionization is also closely correlated to the increase in the disparity between the upper and lower classes as well as the consolidation of wealth in the upper class. Numerous correlations begin to reveal credence for causation.